"The Battle of Cambrai ranks as one of the most thrilling episodes of the whole war. Tanks at last came into their kingdom. The notion that the Hindenburg Line was impregnable was exploded". Captain Stair Gillon: The Story of the 29th Division: a record of gallant deeds. This was the opinion of a man whose Division played a significant role in this battle which opened only a few days after the closure of the high casualty Passchendaele campaign . The Battle of Cambrai was by WW1 standards a short campaign of only 10 days although Haig had initially given the battle commanders only 48 hours to achieve the break through. Cambrai has gone down in WW1 military history as both a success and a failure. Military historians have described it as a battle of tactical experimentation where lessons were learned and used in the Advance to Victory of the 100 days finale in 1918. 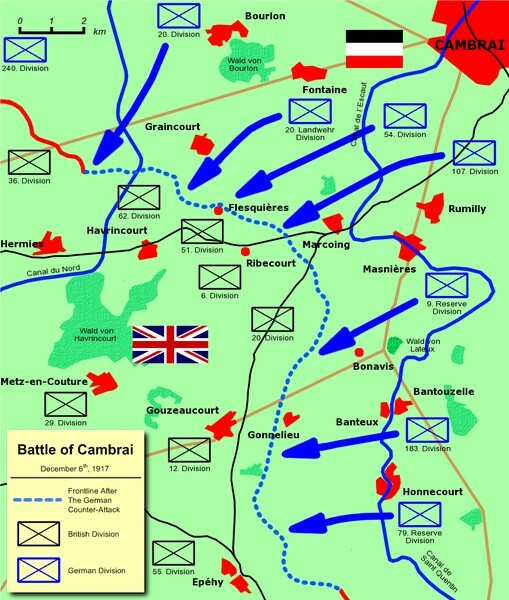 The opening of the Battle of Cambrai on 20 November 1917 is often identified as the first demonstration of the sophisticated techniques and technologies required to effect such a battle. On that day, the British attack broke deeply and quickly into apparently impregnable defences with few casualties. This early result was widely regarded as being a great and spectacular achievement, so positive was it in comparison with the recent ghastly slog to Passchendaele. 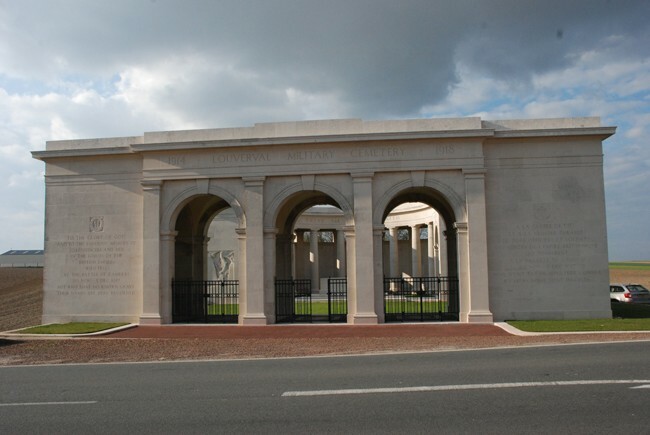 This is the story of the Battle of Cambrai using the experiences of two of my relatives who survived and a relative of a good friend who paid the ultimate sacrifice and whose name appears on the Cambrai Memorial. The plans for such a battle were produced from an idea by General Byng of the 3rd Army and the head of the Tank Corps Brigadier General Elles who wanted the tanks to be used over terrain that suited them and not wasted as in the mud of Belgian Flanders. These ideas were very quickly developed, too quickly in some opinions with insufficient details . The proponents wanted something audacious and totally unexpected by the enemy the antithesis of what had happened in the Third Ypres battle. It was calculated that, provided secrecy could be maintained to the last moment, no large hostile reinforcements were likely to reach the scene of action for forty-eight hours after the commencement of the attack. I informed General Sir Julian Byng, to whom the execution of the plans in connection with the Cambrai operations was entrusted, that the advance would be stopped by me after that time, or sooner if necessary, unless the results then gained and the general situation justified its continuance." "The infantry, tanks and artillery thus working in combination were to endeavour to break through all the enemy's lines of defence on the first day. If this were successfully accomplished and the situation developed favourably, cavalry were then to be passed through to raid the enemy's communications, disorganise his system of command, damage his railways and interfere as much as possible with the arrival of his reinforcements." This was no mean task given that it was the Hindenburg Line which in the vicinity of Cambrai was 5000 yards in depth. The keys to the early success were the secret concentration of 1000 guns many aimed at neutralising the German artillery with 900000 rounds of ammunition and the massing of 476 Mark IV tanks used to flatten the wire and the heavily fortified trenches. Unlike previous operations , there had been training sessions to allow the infantry to develop proper tactics for working with tanks in an offensive. So on day one, 20th November 1917, the infantry supported by the tanks made an advance of 4 miles in four hours with 4000 casualties. By the appalling standards of WW1 this was nothing short of miraculous. Haig’s Official Despatch made much of this unheard of success. "At the end of the first day of the attack, therefore, three German systems of defence had been broken through to a depth of some four and a half miles on a wide front, and over 5,000 prisoners had already been brought in." This story concentrates on that part of the Cambrai battlefield where my relatives fought namely , the so called Right Hook and the Battle for Bourlon Wood to the North. My grand mother’s oldest brother George Shallish of Banwell Somerset was in the 4th Bn Worcestershire Regiment part of the 29th Division initially in reserve on 20th November. The 29th DIVISION had a difficult start to its involvement in the Battle of Cambrai. 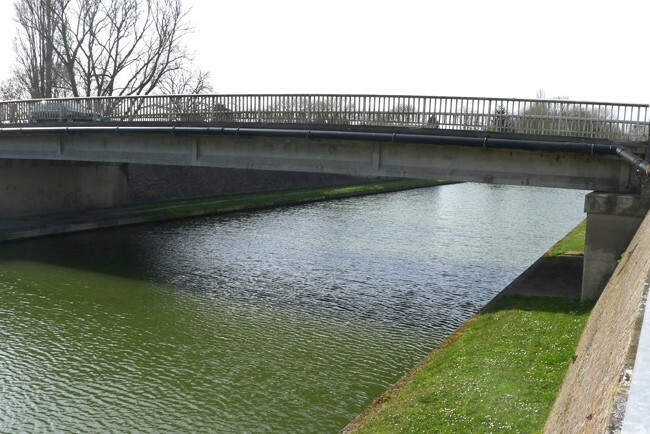 It had to march from an area to the north of Peronne and then on 20th November, to pass through the area taken by 12th and 20th Divisions and secure the bridges over the St Quentin Canal. These bridges were around the heavily fortified villages of Masnieres and Marcoing. So it was that the 86th, 87th and 88th brigades with their 12 battalions from a wide range of regiments including Newfoundland, Guernsey , Essex , Border, Hampshire and Worcester commenced their attack at 10 15 am on 20th November. The 4th Bn Worcester’s Diary WO95/2309 gives the details of their experiences in the successful initial attack. Day spent in drawing battle stores and issuing them throughout the Battalion and resting as much as possible preparatory to moving into the assembly positions for the attack. Reveille 12.15 AM. Troops had breakfast and Battn paraded on the road outside the camp at 2 30 AM. Battn reached the assembly area and formed up without trouble by 4 45 AM. At zero the 88th Bde moved forward to the forming up area. At 10 30 AM ( approx. ) the Brigade bugler sounded the advance. The Battn moved forward over the first objective HINDENBURG LINE and the 2nd objective the HINDENBURG SUPPORT. Seized the CANAL CROSSING at the LOCK in front of the SUGAR FACTORY. Opposition to this point practically nil except for occasional sniping. Some of the Worcesters got across a wooden bridge at Masnieres but were pinned down by heavy machine gun fire and could progress no further forward. The situation was made worse by the steel girder road bridge collapsing into the water under the weight of tank F 22. More and more infantry units arrived together with supporting cavalry who were supposed to be taking advantage of the gaps in the German defences created by the infantry. But the plan was blocked by the lack of canal crossings. Not for the only time during the battle of Cambrai, one Canadian cavalry unit, the Fort Garry Horse, decided to attack the German defences. Finding a way across the canal at a lock gate they charged up a hill against a fortified position and met with a hail of machine gun fire before managing to extricate themselves with heavy losses. However, by midnight on 20th November, most of the 88th brigade had crossed the canal and fighting in the rain and the darkness managed to capture the whole of Masnieres. The 4th Bn Worcesters diary account of its experience of the early hours of the battle confirms that the Germans were indeed taken by surprise and that the Hindenburg Line had been breached more easily than anyone could have possibly thought. However, the early successes did not continue as the Germans rushed reserves to stem the BEF advance so that the plan to release the cavalry to encircle Cambrai was never achieved. (Infantry) Coys crossed the Canal. One platoon followed the banks up to the MAIN BRIDGE. The bridge having been partially blown up by the enemy collapsed beneath the weight of the tank. The 29th Division‘s next move was supposed to be forward towards the village of Rumilly scheduled for 11am on 21st November but the enemy had different ideas. At 10 30 am they launched a counter attack against Masnieres. The British managed to hold out but this was effectively the end of the forward movement on this part of the front. The 29th Division had fought itself to a standstill and its battalions were used to consolidate the positions gained. Day occupied in consolidation and in dealing with snipers. Day quiet consolidation continued . Soon after dark the Battn was relieved by the 1st Guernsey Light Infantry and proceeded to billets in MARCOING. In billets in cellars in MARCOING. Day spent in cleaning equipment. Village shelled heavily all day . Battn continued consolidation of the reserve trenches. After this initial amazing success, things went wrong in a big way. Whilst gaps had been created in the German defences, for various reasons including the destruction of a key bridge by the weight of a tank, the cavalry did not go through to surround Cambrai . In addition the Germans still dominated the high ground to the North around Bourlon Wood and almost 40% of the tanks had been destroyed or damaged and could take no further part. "It was not possible, however, to let matters stand as they were. The positions captured by us north of Flesquieres were completely commanded by the Bourlon Ridge, and unless this ridge were gained it would be impossible to hold them, except at excessive cost. If I decided not to go on, a withdrawal to the Flesquieres Ridge would be necessary and would have to be carried out at once." The 40th Division originally a bantam unit and not much used by the high command in 1916 and early 1917,was ordered to take over from 62nd Division and to spearhead the attack on Bourlon. Within the 121st Brigade was the 12th Bn Suffolk Regiment in whose ranks was my grand father’ s cousin Arthur W Maltby from Cambridge. They were given the task of attacking the village of Bourlon whilst other 40th Division units attacked the wood. 22 In camp at BEAUMETZ. Moved to trenches in BOURLON. Relieved 62nd Division as Reserve Batt. 10 AM Received orders to attack BOURLON VILLAGE. Issued orders for attack. 3 PM Attack launched B coy penetrated village on the right . D coy held up by MG fire A coy moved to reinforce D coy C coy reinforced B coy. 5 PM News received that Battalion on right was digging in the wood & issued orders for Coys to retire to old line. 2 Coys of 12th Suffolks on left front. moved to trenches in Hindenburg support line . marched to billets in BAILLEULMONT. Douglas Haig’s Official Despatch describe this very brief involvement in the Cambrai offensive by the underutilised 40th Division. "The din of battle in the wood was awe inspiring . In front trees were falling wholesale from the shells of our guns while around and behind the German projectiles were crashing everywhere. The roar was supplemented by the ceaseless chatter of machine guns and of our Lewis guns." The peeling of church bells in England on 23rd November to signify a precious victory was both premature and grossly over optimistic. It certainly was not a victory as on 24th another attempt by the 40th Division troops and tanks to take Bourlon village failed in the teeth of a strong counter attack. This was repulsed at great cost but the initiative was passing to the enemy. Although, Haig feared a repeat of the Third Ypres attritional losses, he authorised one last attempt to take Bourlon . At 6 20 am on 27th the hastily organised attack was launched by very tired men in a blizzard. The remaining tanks allocated to this battle were again blasted to pieces by German artillery who were developing ways of eliminating the tank threat. It was the end of the offensive as the BEF went into defensive mode to hold back the reinforced Germans. The German high command was now convinced that the BEF was a spent force and planned a massive counter attack . There were so many advanced warnings of this that in the after math people could not understand why the British high command had not been more prepared. The reality was that they were not as at 6 am on 30th November the German artillery launched an enormous barrage followed by a huge infantry attack of storm troopers through the early morning mist . a tactic to be repeated in the spring of 1918. The BEF was in a state of total confusion in many places with defences only being held by a motley assortment of HQ staff, cooks and other back room soldiers. However, the British defence was stronger than the Germans had thought possible and although in some places the British were pushed back three miles in most instances they held fast and inflicted massive losses on the advancing Germans . In his Official Despatch , Haig paid special attention to the gallantry of the men of the 29th Division who held back a series of ferocious attacks to maintain their position. The nature of this defence at all costs can be seen from the experiences of the 1st Border Regiment , 29th Division,in whose ranks was Captain J Walter Ewbank the relative of a friend of mine. J W Ewbank had proved himself to be a very competent leader having survived everything thrown at him since 1915 including, Loos, Gallipoli , the Somme, Arras and Ypres and winning the MC and Bar. He found himself attached to Brigade HQ at the time of the German attack on 29th November 1917. The 1st Battalion Border Regiment War Diary provides the details of their movements in late November arriving in Marcoing on 26th November joining up with 4th Worcesters also in the 29th Division whose story has been told above. The Batt moved into MARCOING and lived in cellars. Good cellars with accommodation for nearly the whole battalion. Thanks to the BOCHE most were heavily concreted & beds erected in them being nicely located & furnished with stores. 30th At 5 45 am the enemy commenced heavy shelling of the whole front line using good deal of gas shell and lacrymasory & slight mustard oil. From the intensity & extent it was obvious that the BOCHE was counter attacking. All lines to the rear were cut and no information came through until about 10 30. The enemy had broken through and had actually been right round Marcoing Copse & as far as the outskirts of the village. They had however been counter attacked by a party collected by Captain J W Ewbank M C of Brigade HQ & then by 2nd S W B & 1 KOSB & finally units of 88th Inf Bde & pursuing them out of MESNIERES back to their original lines. All of the 29th Divisional Brigades were involved in a stout defence of both Masnieres and Marcoing villages so that the German advance was halted in this sector and with very heavy losses to their storm troopers. It is probable that the defence by the 29th men prevented a total disaster and a major German break through on the right sector of the battlefield. 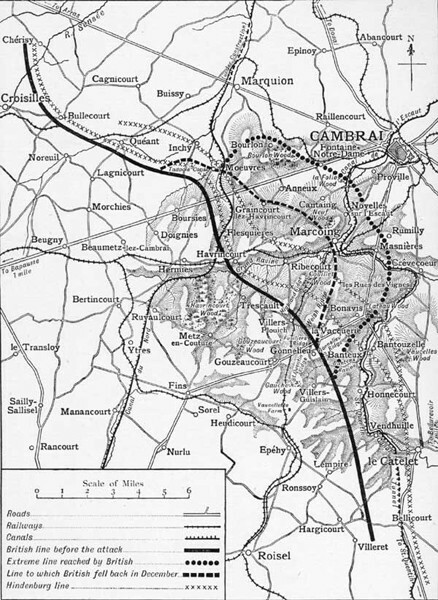 During the night of 3rd December it was decided that the canal line could not be held and so the troops including the 4th Worcesters and 1st Borders were withdrawn. Stood to rest of the day ready to move if required. Heard that BOURLON WOOD and MARCOING were evacuated during the night ! Relieved this evening by 26th Division & the battalion marched back to SOREL. Everyone thoroughly exhausted & dead tired. The Border Regiment in the Great War by Colonel H C Wylly has a section describing the heroic action of this small band of non infantrymen led by Capt. Ewbank. The 29th passed tolerably quietly , but on the next day the enemy broke through beyond the right of the 29th Division and got right around Marcoing Copse and as far as the outskirts of the village, when he was counter attacked by a party of cooks, orderlies and others collected by Captain Ewbank ,M C from Brigade Headquarters and the enemy was finally, with the assistance of other battalions driven back to his original line. During this last phase of the Battle of Cambrai , Captain J W Ewbank M C and 1 man had been killed the officer in leading the attack to clear Marcoing Copse. Captain J W Ewbank’s body was never found and he with the other 7000 killed without graves are commemorated on the CAMBRAI Memorial . For this heroic action he was awarded the Croix de Guerre by the French government to add to the MC and Bar gained over a period since the Battle of Loos in which he had been badly wounded. All along the front the British put up a very stout resistance so that even though the Germans made some advances they were not as big as those of the British on 20th November and they were extremely costly in terms of German casualties. In places the British even counter attacked including an old world cavalry charge around Villers Guislain like the one portrayed in the Steven Spielburg film WAR HORSE. Haig makes a mention of this in his Official Despatch without referring to the actual cavalry charge, rather strange for an old cavalry man. 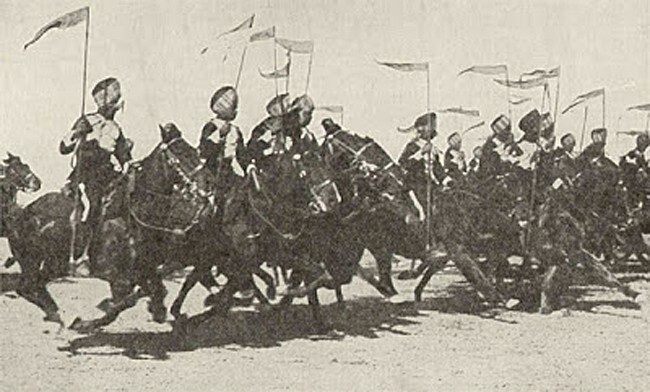 The charge was undertaken by the 2nd Lancers (Gardner’s Horse) and described by Jiwan Singh in a letter of December 1917. "This was the first time that we have been called upon to fight as cavalry in our three years field service. Thanks be to God the attack was made with the utmost bravery and achieved splendid results . The fury of our charge and the ardour of our war cries so alarmed the enemy that he left his trenches and fled. At first we were assailed by machine gun fire like a rainstorm from left and right and afterwards from the front but how could the cowardly Germans stand before our onslaught." 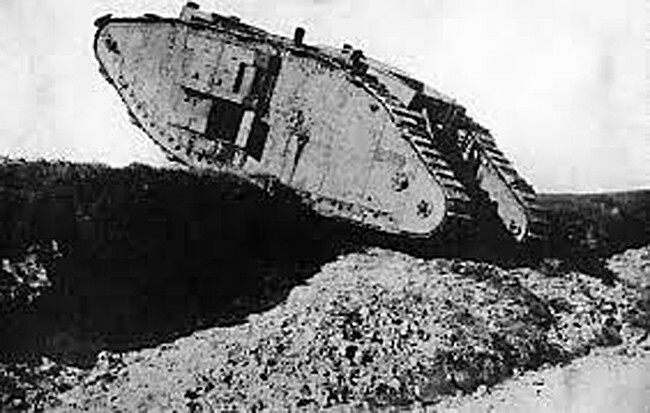 It had been the intention after 48 hours of the Battle of Cambrai for the cavalry to go through the gaps generated by the tanks but did not happen as planned. This belated use of the cavalry was an incredibly brave but pointless attack resulting in heavy casualties of men and their magnificent horses, the survivors having to retreat rapidly to safer positions. 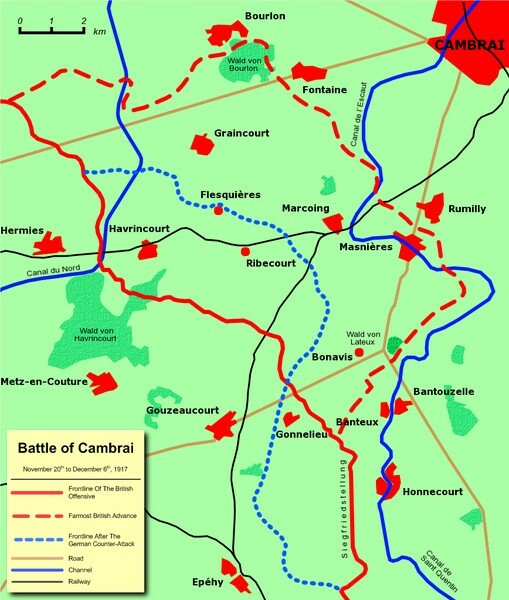 In the face of the German attacks the British were forced to retreat to the St Quentin canal at which point the fighting became ferocious and costly to both sides. By 3rd December Haig had had enough. He told London that there could be no further offensives and that his troops were so exhausted that even holding their existing positions was impossible and so the survivors retreated to prepared defensive positions giving up the gains of the early battle. One factor influencing his decision to call a halt was the very real evidence that Germany was preparing a major offensive in 1918 using troops released by Russia’s surrender in the East. Haig knew that if this were to happen he would need all the troops he had and more to defend the Western Front. 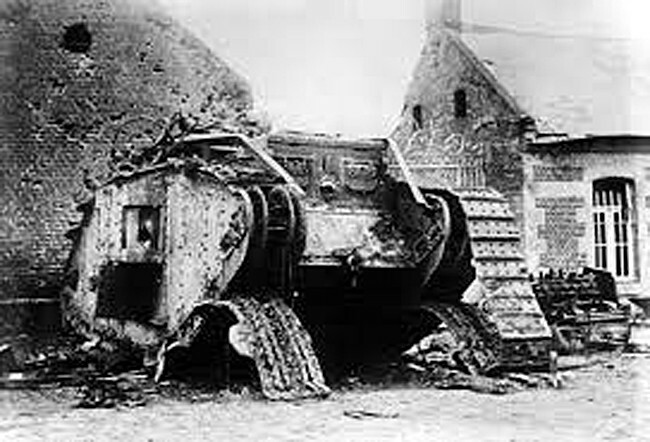 Cambrai had been a very costly battle with 45000 casualties on each side. British dead and missing were about 22000 and 6000 had become POWs during the German counter attack. For an offensive that had been so successful at the beginning that church bells had been rung at home, the outcome was considered another disaster by some commentators of the day. The early gains of four miles ended with a retreat of over three miles .The open warfare of the initial attack with new techniques involving the coordination of tanks, artillery and infantry degenerated into the old trench war stalemate. "In conclusion, I would point out that the sudden breaking through by our troops of an immense system of defence has had a most inspiring moral effect on the Armies I command, and must have a correspondingly depressing influence upon the enemy. The great value of the tanks in the offensive has been conclusively proved. In view of this experience, the enemy may well hesitate to deplete any portion of his front, as he did last summer, in order to set free troops to concentrate for decisive action at some other point." The disappointment at home turned into a blame game. The War Cabinet ordered an official enquiry into the conduct of the Cambrai campaign headed up by General Jan Smuts . Of particular concern was the degree of unpreparedness for the German counter offensive and the way in which some units gave up and fled with no resistance although this was only in a small part of the front . However, the outcome of this enquiry was to lay the blame on those in the front line with General Byng telling the enquiry that although the troops were of adequate strength their poor showing in certain quarters was down to the lack of training. Haig’s own view was that he was responsible for broadening the front with the attack on Bourlon Wood which overstretched the men and made it difficult for them to resist the German counter attack on 30th November. For someone who was deemed to be a “butcher ‘ with no care for the ordinary man, this acceptance of blame and protection of the ordinary man was indeed a revelation. However, it was only when the Official History of the Cambrai campaign was published in the late 1940s that the blame was finally apportioned to the senior officers for failing to take the German preparations for a counter attack seriously. The "Poor bloody infantry" were exonerated and quite rightly given that they had fought themselves to a standstill and had managed to stem the advance of a more numerically superior force. Cambrai 1917 was a real test of a new style of warfare for both sides. It was the beginning of the end of the trench stalemate and the beginning of a more open all arms war. The British would next have to withstand another onslaught of the German storm troopers in 1918 before they themselves could go on the attack using techniques modified from the experiences at Cambrai in the 100 days Advance to Victory . On 20 November 1917, the British Third Army under Sir Julian Byng launched a surprise attack against the Hindenburg Line, in front of Cambrai. Using a combination of massed tanks – available on good ground in large numbers for the first time – and a bombardment using predicted fire (no preliminary ranging shots to give the game away), the assault was by the standards of the day incredibly successful. 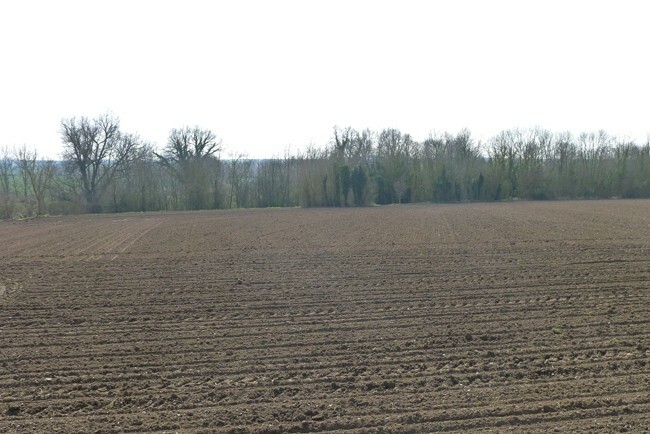 However, Bourlon Wood, a bulwark in the enemy positions held and it was here that the 40th Division was to win fame. When first presented with the plan for the attack, British Commander in Chief Douglas Haig recommended strengthening the left flank to take Bourlon Wood very early but Byng ignored his advice. By nightfall on the 20th, it was clear that Haig had been right. From the dominating height of the wood, the Germans held the British advance in front of Anneux and Graincourt. There was good news, however, as the 51st (Highland) Division crept into Flesquières, abandoned during the night by the Germans. On the morning of the 21st, the 51st Division moved forward with the aid of two tanks towards Fontaine, but were held up by fire from the Wood. Commander of the 51st Division General Harper ordered a halt until the 62nd (2nd West Riding) Division had captured the heights. The latter had a violent and costly battle for Anneux, led by the 186th Brigade. 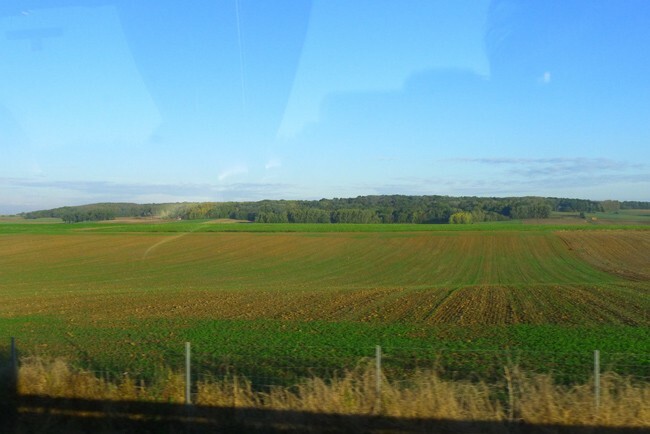 To the north, the 36th (Ulster) Division, planning to continue their advance beyond Moeuvres, waited for the success signal, signifying that the 62nd had captured Bourlon. It never came, for the 62nd could not penetrate beyond the sunken lane facing the wood. By the evening of the 21st, Haig was satisfied that 'no possibility any longer existed of enveloping Cambrai from the south'. In other words, the rationale for the whole action had now been lost. But the British were now in an exposed position in the lee of Bourlon Wood, the capture of which would still prove to be useful, in cutting German access to key light railway lines feeding their front. Haig and Byng decided to press on, even though it meant deepening the salient that had been created, and throwing in even more troops into this northern sector of the battlefield. On the 22nd, 40th Division at Beaumetz-les-Cambrai received orders to relieve the 62nd Division the next day. By now the roads were breaking up under the strain of thousands of men, wagons and lorries. 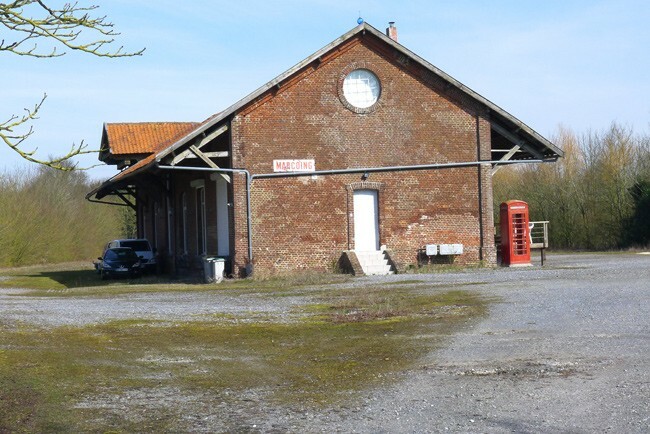 It took 40th Divisional HQ 15 hours to travel the 9 miles to Havrincourt. A relief and assault plan was quickly drawn up: 121 Brigade to capture Bourlon, 119 Brigade to go for the Wood, both jumping off from the sunken lane. On their right, the 51st Division would move forward to Fontaine. On the left, the 36th would go in again at Moeuvres. 92 tanks would support these units. They attacked through ground mist on the morning of the 23rd. Some of the units of the 40th had to cross 1000 yards down the long slope from Anneux, across the sunken lane and up the final rise into the Wood, all the while under shellfire. There was close and vicious fighting in the Wood, but after 3 hours, the Welsh units of 119 Brigade were through and occupied the northern and eastern ridges at the edge of the undergrowth. The 121 Brigade was cut down by heavy machine gun fire, and few got as far as the village. Seven tanks did so, but were unsupported and the survivors withdrew. On the flanks, the 36th and 51st Divisions made little progress against strengthening opposition. Over the next few days, further troops were thrown into the battle, including the Guards who advanced into Fontaine. Once his troops had been driven from the wood, the enemy switched all of his artillery onto it. Battalions in the wood were wiped out. Three companies of the 14th HLI miraculously penetrated to the far side of Bourlon in an attack that commenced at 3pm on 24 November, but were cut off and gradually annihilated. And it began to snow. The British now sat some way ahead of the position of 20 November, being in possession of a salient reaching towards Cambrai, with the left flank facing Bourlon, and the right alongside the top of the slope, which ran down towards Banteux. The 40th Division suffered losses of 172 officers and 4017 other ranks in this action.